For both of these bracelets I thought I would try a different knot for the catch of the bracelet. I tied a Double Knife Lanyard Knot and once I tried them on I wished I had tied the single. While typing on my laptop I learned that the knot made it really hard to type because it was too big. The Double Knife Lanyard Knot looks cool but it's just too big and shouldn't be used for bracelets. For the earth tone bracelet I used black and coyote brown with coyote tan 550 Type III Nylon Paracord. 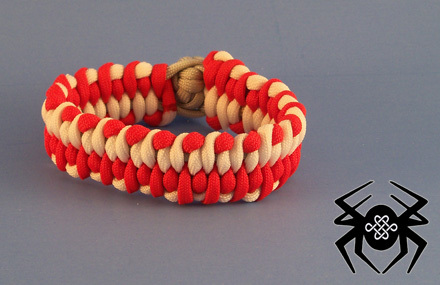 For the other bracelet I used red and white with silver 550 Type III Nylon Paracord. Each bracelet used around five feet for the main strand and two feet for the tying strand.